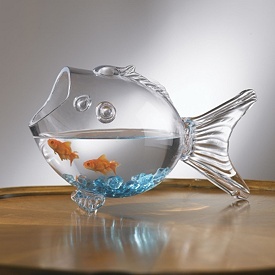 waiting « Living Life in a Fish Bowl! Today I want to look at Paul and Silas in Acts 16. A woman was following them shouting at them. I find it interesting that she was speaking the truth but in time it got on Paul’s nerves, so he addresses the spirit that was controlling the girl and cast it out. Her owner seized Paul and Silas and brought them before the authorities. The crowd joined in the attack. They were stripped and beaten. Finally they were thrown into prison. Now stop a moment and think of what you would be thinking if this had happened to you. ? It certainly seems like an unjust punishment. Sometimes in our lives we must endure what seems like an unjust set of circumstances. What were Paul and Silas doing while they waited in the dungeon? Were they rehashing what had happened? Were they wallowing in self-pity? Were they letting anger control them? They were singing. At the midnight hour, God gave them a song in their heart to sing. At your midnight hour, God will give you a song too. Open your mouth and start singing. While I’m waiting, I will praise You! I am reminded of a powerful little chorus. Sometimes life can seem like I am treading water – in over my head – emotions shot – I am a mess and God is asking me to wait a bit longer. He asking me to keep trusting Him. Singing praises to God from a heart of thanksgiving is something we can do right now in this moment. It is not dependent on our circumstances. Giving God thanks is one way that we magnify Him. What you magnify will be the thing that dominates your thoughts. While I am waiting for the answer, for the solution, for direction, I will praise Him. What will you do? I really don’t like waiting. Seriously, does anyone? Yet over time I have learned to wait more graciously. I seem to have lots of practice opportunities. Everyone does. When our boys (twins) were little they were not sleeping through the night. They would take turns being awake. They made a great tag team. I did not function well on little sleep. Finally, the doctor told us that we needed to change our tactics. After they were fed and changed we were to put them to bed (awake) and let them learn the art of falling asleep on their own. Curtis was at this particular doctors visit and he believes in following doctors orders. So that night he had to literally restrain me from going in there. It was the longest few minutes of my life. The waiting was horrible. The result —- they slept through the night that night and from then on. My babies were beginning to learn the art of waiting. One thing is for sure morning is coming. Things are always changing. There is another scripture verse that I seem to return to quite often. In a society where you can drive up for your coffee, food, banking, and even in some places worship – there are still things that cause us to wait. It is the way we wait that we have control over. I cannot make the doctor hurry up and call but I can rest in the knowledge that God is in control. While I wait for the day that I only work one job, I can choose to make the most of the opportunities that my second job gives to me. When the night seems long I can hold on because morning is indeed coming. Lord, help me to remember that nothing is going to happen to me today that You and I can’t handle.